The English language is full of cliches -- "keep your nose to the grindstone," "a bird in the hand is worth two in the bush," "don't count your chickens until they're hatched," and so on -- but "the greatest thing since sliced bread" definitely falls on the weirder end of the spectrum. After all, sliced bread doesn't really seem all that great: available in almost every corner store, it tends to be cheap, mushy stuff without much flavor or texture to recommend it. It is a humble food, a blank palette for peanut butter, jelly, or cold cuts. But for consumers in 1928, when it was first unleashed upon an unsuspecting public, presliced, packaged bread was a revelation. For the first time, it was possible to walk into a bakery, buy a package of sliced bread, and then -- best of all! -- not worry about it going stale. That, as Derek Thompson recently explained at The Atlantic, was the key: Because of its exposed surfaces, sliced bread tends to dry out very quickly. To make it marketable, bakers had to not only figure out a way to slice the bread, but also how to wrap it so that the loaf stayed tightly together. The ultimate solution, which Missouri's Chillicothe Baking Company first sold on July 7, 1928, involved sliced bread, a cardboard tray, and a waxed paper wrapper. Sales were slow in the beginning, but the electric toaster -- which was beginning to be mass-produced at the time -- helped things along. After all, while hand-slicing loaves was always tedious, the difficulties of cutting bread to fit a toaster made pre-sliced loaves even more attractive. Two years after Chillicothe first offered its bread, the technological marvel of the modern age really took off, when one of the few nationally marketed bread brands started selling its loaves sliced. For its customers, the name of the brand seemed especially appropriate. 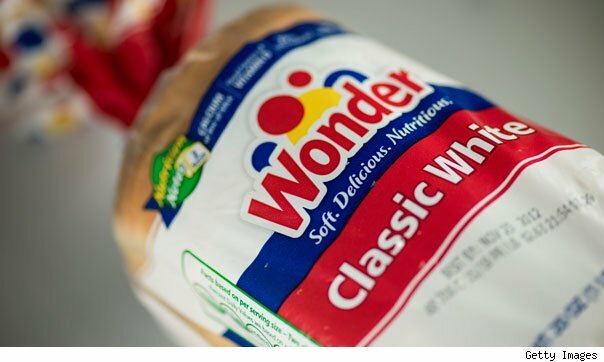 It was, after all, something of a "Wonder Bread."